One of my favorite SNL sketches is about a product experience – specifically a product experience for seniors. The sketch is a spoof on the Alexa device from Amazon, but altered to be usable for the octogenarian crowd. Adjustments include a much louder voice, being able to respond to names other than “Alexa,” and an “uh-huh” function for long, rambling stories. Comedy aside, this sketch highlights an important consideration for product designers: who we design for matters, and if we’re not careful, our designs can unintentionally alienate the users. Consider the field of telecommunications: for years the standard telephone technology was a landline, usually with fairly standardized functions (dial or keypad, 911 for emergencies, 0 for operator, etc.) Everyone knew what a dial tone was, everyone knew what a busy line sounded like, and the most revolutionary advancements were the invention of the answering machine and cordless telephones. That is, up until we made a huge leap to cell phones, then an even bigger leap to smart phones. Imagine that you have spent 50-60 years of your life using a telephone one way, then at the moment when your memory and fine motor skills stop being what they were, now everyone is using an iPhone. Scary, right? Sometimes the worst part about getting older is when technology makes you feel incompetent, and becomes a grim reminder that you are, in fact, getting older. Not being able to adequately communicate with others only exacerbates that feeling, and leaves many people feeling disconnected and isolated. As product designers, we can improve the situation by taking into consideration not just our “ideal” user, but all users for our products. “Universal design” is about designing for those on the margins and helping them connect with everyone else. It’s about approaching a product from that user’s point of view, and considering features that will positively impact their experience. If we design universally, everyone benefits because this design experience typically includes features that make the device easier for everyone to use. Let’s go back to telecommunications: when we were designing physical communications hardware for Clarity, and working with a team of software developers, we noticed that the developers didn’t necessarily communicate the way elderly people do. For instance, we now use the term “contacts” instead of “phonebooks”, “voice mail” instead of “answering machine” and so on. This seems small, but when you’re considering every angle of a device and how it will be used, those details can lead to big design decisions like visual hierarchy, how we label different features and functions and where we place buttons. For this product we had to start thinking like someone who had had a completely different experience with this type of product for most of their adult lives. 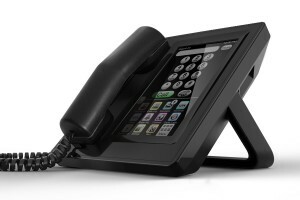 It lead to design changes including a keypad that got larger when the receiver was lifted, but reverted back to their smaller format when the call was over. When designing products let’s watch out for unintended biases, not just in regard to culture, but to age as well. As the Baby Boomers approach their senior years, this important market will still want to feel like they can function independently, are connected to others, and valued. Just like we all do.